The bye week is now over, and it's time to get back to the matter at hand, which is the football season. The Fighting Illini football team enjoyed a much needed bye week this past week, and according to head coach Tim Beckman, "it couldn't have come at a better time". Since the Illini are playing so many young players this season, the bye week gave them a chance to rest their legs and prepare for the final non-conference tilt, when they welcome the Redhawks of Miami (Ohio) to Memorial Stadium in Champaign on Saturday morning (11:00 am CT, BTN). The last time out, the Illini were defeated for the first time this season 34-24 by the Washington Huskies at Chicago's historic Soldier Field. Even though the Illini lost the game, some positives can be taken from that game. Most notably is the fact that the Illini never quit when they got down early in the third quarter. The team rebounded, and made it a competitive contest, and even though the Illini dropped a couple of passes that could have resulted in touchdowns, the future of the program has the needle pointing upward. Now on to this week's game. The Redhawks have been struggling so far this season, only totaling 448 yards of offense in their first 3 games, all of which have been losses. The Miami quarterback, Austin Boucher, has accounted for 268 of those yards, but only has thrown one touchdown, Needless to say, the Redhawks are not firing on all cylinders, but this is the type of game that the Illini cannot overlook for any reason. The Illini have equaled their win total of last season, and a win on Saturday will surpass that total. I remember giving the Illini four wins at the beginning of the season, and I am not about to adjust that total. However, I am starting to see some positive signs in and around the program, and this year's team seems more cohesive than the one that self-destructed last season. But, bear in mind, the losing streak in the Big Ten is still 14 and counting, so there is still some work to be done before the Illini will be "officially back". But, things are looking up. The future schedules have now been completed up through the 2017 season, and with the addition of a home and home series with North Carolina in 2015 and 2016, the quality of opponents are on the upswing. Earlier this season, the Big Ten conference came out and said that they would refrain from playing FCS opponents and scheduling them in the future, but as you will look at the list of schedules in the years to come (http://www.fightingillini.com/sports/m-footbl/sched/ill-m-footbl-sched.html), you will notice that Murray State appears on there in 2016. The Racers are an FCS opponent, but this was already scheduled before that mandate went into effect. There is even a game scheduled in 2018, which seems like a very long time away (actually it is). Kevin Hambly's women's volleyball team ventured out to Tobacco Road this past weekend, and the trip down that road wasn't one to remember. The Illini lost to #15 North Carolina in straight sets on Friday night, then made the short trip to Durham on Saturday night when they were defeated by the Duke Blue Devils 3-1. The Illini, although 4-6 on the season, are still among the nation's top 25 teams, mainly due to their schedule, which has been one of the toughest in the nation. The Illini begin Big Ten play this weekend when they welcome Iowa to the State Farm Center on Friday night (7:00 pm CT, No TV), then get paid a visit by yet another top 25 team, Nebraska, on Saturday afternoon (4:00 pm, BTN). The match on Friday at the State Farm Center is the test run for the NCAA Regional that will be held in December. Janet Rayfield's women's soccer team began conference play last weekend in Columbus, and played Ohio State to a 1-1, double overtime tie. The Illini will return to the Illini soccer complex this weekend to battle Iowa on Friday night (7:00 pm, CT), then will welcome Nebraska on Sunday afternoon for the annual Illini Soccerfest (4:00 pm, CT). The Illini are currently 5-2-2 overall and 0-0-1 in Big Ten play heading into this weekend's action. Illini basketball practice officially begins this weekend, and if there wasn't a lot going on campus, both the men's and women's teams are holding "Illini Street Jam", in which the corner of Green and Wright Streets in the heart of campustown will be transformed into a basketball court. Always thinking outside the box, the Illinois DIA is hoping that this event will be well attended. The festivities begin at around 7:30 pm on Saturday evening, and should last for about an hour. Be there! You can view the 2013 Fighting Illini football season as a season of quarters. With 3 games now in the books, that would signal the end of the first quarter. In grading the Illini through the end of that quarter, it would be fair to assume that they have done fairly well, most deserving of a B- to C+ grade. Already, Tim Beckman's team has exceeded expectations, and undoubtedly, earned him at least another year as the head coach. The dominating win over Cincinnati can be attributed to this, but last Saturday at historic Soldier Field in Chicago, the Illini held their own against a formidable Washington squad, losing 34-24. In looking at the statistics, it becomes apparent that the Huskies were dominant, out-gaining the Illini in total yards 615 to 327. Washington, who runs a fast-paced offense, was able to get off 89 plays against the Illini, averaging a play roughly every 10-11 seconds. The Huskies struck in quick flashes, led by their outstanding running back Bishop Sankey, who carried the ball 35 times for 208 and a touchdown. Washington quarterback Keith Price was also very efficient, completing 28 of his 35 passes for 342 yards and a pair of touchdowns. Sankey also caught a touchdown pass from Price, but his main target was Kevin Smith, who caught 5 passes for 104 yards. The Huskies' outstanding tight end, Austin Seferian-Jenkins, was not effective, only catching 3 passes for 8 yards. Seferian-Jenkins has the build to play at the next level, and the fact that he is coming off an injury could stand the reason why he was severely limited in the game. On the Illinois stat side, quarterback Nathan Scheelhaase didn't have the best of days, only completing 9 of 25 passes for 156 yards and a touchdown. However, the blame cannot be dumped solely on Scheelhaase, as 2 receivers, Ryan Lankford and Steve Hull, both dropped sure touchdown passes at some point in the game. As far as the running game went for the Illini, they rushed 36 times for 136 yards, and scored twice on the ground, once by Scheelhaase, and the other score was a 10 yard scamper by freshman Aaron Bailey. In his short career, Bailey continues to impress, and gives the Illini another added dimension that Scheelhaase doesn't possess. The aforementioned Lankford only caught 3 passes on the night, but one of those was a quick strike for 72 yards that did go for a touchdown. When the Illini got down 31-10 in the third quarter, things began to remind Illini fans of last year, when the team would pretty much mail it in and accept the consequences. However, this team has a different mantra, and the strike from Scheelhaase to Lankford brought the Illini ever closer. The Illini narrowed the gap further on Bailey's scamper, but couldn't get any closer to drop the game. The Illini enjoy the first of their 2 bye weeks this weekend, and the time off is welcomed, since this is still a young team and a lot of players have seen action already. The Illini will conclude their non-conference portion of the season next Saturday when they welcome the Redhawks of Miami (Ohio) to Memorial Stadium (11:00 am CT, BTN). To think of a possible 3-1 pre-Big Ten record would have been unheard of at the beginning of the season, and with the conference being somewhat down this season than in years past, the dreaded B word is being bandied about. But, I'm getting a little ahead of myself here, so I won't go there. Kevin Hambly's Illini volleyball team continues to welcome any and all comers to their schedule, and as evidenced by last weekend's Illini Classic, they can go toe-to-toe with anyone in the country. The Illini welcomed Arizona State, #6 Washington and #2 Texas to Huff Hall last weekend, and although they came away with a 1-2 mark on the weekend, they feel confident that the upgraded competition will serve them well once the Big Ten season begins. The Illini defeated the Sun Devils 3-2, but lost to the Huskies 3-1 and the Longhorns 3-2, in front of huge crowds for all matches, including the Arizona State match, which began at 10:00 am on Friday morning. The Illini will wrap up their non-conference portion of the schedule this coming weekend, when they travel to ACC country to battle the Tar Heels of North Carolina on Friday night (6:00 pm CT), and then over to Durham on Saturday evening to battle the Duke Blue Devils (5:30 pm CT). The Illini currently stand at 4-4 overall heading into the weekend action. The Illini women's soccer team finished the non-conference portion of their season this past weekend with a pair of wins, defeating Indiana State 3-2 on Friday night, then taking down Florida International on Sunday afternoon 4-0. The Illini improved their season mark to 5-2-1 with the wins, and will begin Big Ten play this Friday when they travel to Columbus to battle the Ohio State Buckeyes (4:00 pm CT). The match against Ohio State is the only contest on the schedule for this weekend, so that will give Coach Janet Rayfield's squad a chance to rest before the meat of the conference schedule gets going next weekend. Finally for this week, a bit of basketball news. The 2013-14 men's basketball team will conduct an "Illini Street Jam" on Saturday, September 28th at 7:30 pm at the corner of Wright and Green Streets in the heart of the University of Illinois campus. Both the men's and women's teams will be unveiled at this event, and both teams will also participate in the jam, which is free and open to the public. This event coincides with Dad's Day and the football game with Miami (Ohio), and will follow the volleyball match at Huff Hall against #12 Nebraska, which starts at 4:00 pm. After an auspicious start to the season, in which they narrowly defeated Southern Illinois 42-34 in the opening game to the 2013 campaign, the Fighting Illini football team were looking for any positive signs to move the program forward. They received that, and then some. The Illini had one of the more complete performances in recent memory in defeating the Cincinnati Bearcats 45-17 last Saturday at Memorial Stadium in Champaign. The offense, which is apparently still very fluid, once again posted great numbers, amassing 522 yards of total offense. Redshirt senior quarterback Nathan Scheelhaase continued his early season success, completing 26 of 37 passes for 322 yards and throwing for 4 touchdowns. Scheelhaase, who seems to be thriving under new offensive coordinator Bill Cubit, involved 11 receivers into the game, led by junior college transfer Martize Barr, who caught 5 passes for 72 yards, including a nifty touchdown pass diving into the endzone. Steve Hull, Josh Ferguson and Evan Wilson also caught passes for scores, and what is most significant about Wilson is that this offense is finally utilizing the tight end, which couldn't be a better option at this point. With the likes of Wilson, Matt LaCosse and Jon Davis among the stable of tight ends, this crew is proving to be one of the most talented group at the position in several years. Besides the passing game, the Illini also had the running game going as well, as they rushed for 210 yards collectively. Junior Donovonn Young led the attack on the ground with 64 yards on 14 carries and 1 touchdown. Perhaps one reason for the success in this game could have been the return of lineman Ted Karras, who missed the first game with an injury. Karras brings a level of authority to the offensive line, and according to Coach Tim Beckman, "he is very vocal and emotional leader". The defense, which was a concern coming into the season and didn't quell critics after their lackluster effort against the Salukis, fared much better against the Bearcats, and could be considered a success only surrendering 17 points to a team that scored 49 a week earlier against Purdue. Going into the season, the non-conference portion of the schedule appeared daunting, and the road doesn't get any easier, as the Illini venture away from Memorial Stadium for the first time in the 2013 season Saturday to take on the Washington Huskies for the Chicago Homecoming at historic Soldier Field (5:00 pm CT, BTN). The Huskies, who were idle last week, defeated Boise State two weeks ago 38-6, and feature a high-powered attack from both ends of the offense. Quarterback Keith Price completed 23 of 31 passes for 324 yards and 2 touchdowns in the win over the Broncos, while Bishop Sankey carried the ball 25 times for 161 yards, finding the endzone twice. Jaydon Mickens caught 9 passes for 109 yards to lead the Huskies in receiving, but did not catch any for a touchdown. Against Boise State, Washington averaged just 9 seconds per play, so they can run a lot of plays in a short amount of time. Head coach Steve Sarkisian is a true proponent of the west coast offense, and he is the same person that led the offense for USC the last time the Illini went to the Rose Bowl. Whatever the outcome is against Washington this weekend, it is apparent that the Illini are turning some heads and that this season may not turn out to be such a downer as originally thought. But, I will caution, it is still early. After splitting matches last weekend in Ames, Iowa, the Fighting Illini volleyball team returns to the confines of Huff Hall to host the 30th annual Illini Classic. Starting on Thursday evening, there will be 4 teams in action, including #2 Texas, #6 Washington and #27 Arizona State batlling the Illini over the 3 day tourney. The Illini will begin play on Friday morning when they take on Arizona State at 10:00 AM, then will play Washington later that evening at 6:30 PM. The Illini will then take on the #2 ranked Longhorns Saturday evening at 7:00 PM, in which promises to be a showdown on the volleyball court. The Illini are currently 3-2 overall on the season. The Fighting Illini women's soccer team returns home to the soccer complex this weekend to take on Indiana State and Florida International in a pair of matches. The Illini lost once and tied the other game this past weekend in the Sun Devil Classic on the campus of Arizona State. The Illini lost to the host Sun Devils 4-3 in double overtime, and then came back two days later to tie Arizona 1-1, also in double overtime. The match this weekend at home against Indiana State on Friday night at 7:00 pm, and the match on Sunday afternoon against FIU begins at 12:00 noon. The Illini are currently 3-2-1 overall on the season. Fighting Illini men's basketball coach John Groce received another official visit from a recruit over the past weekend, as point guard Quentin Snider visited campus as a prospective recruit. A decision, although not confirmed yet, could come any day, as early as Thursday afternoon. At least the updates to the stadium were easy on the eyes. 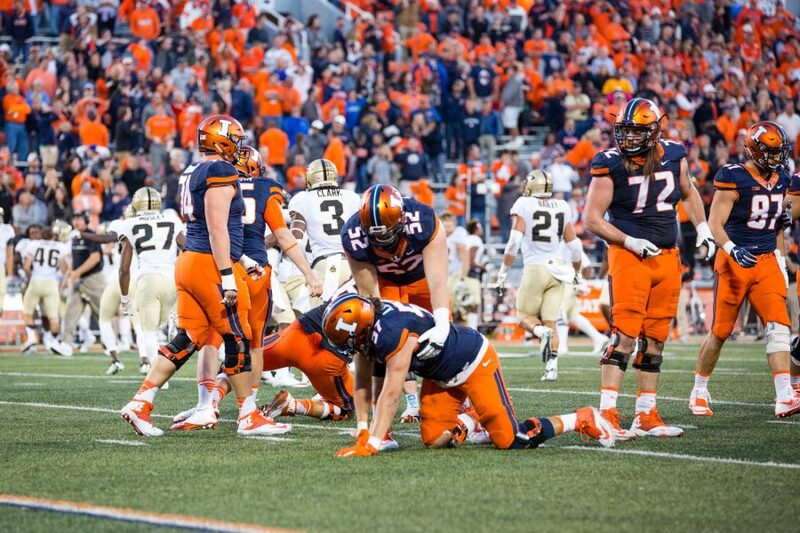 The Fighting Illini raised the curtain on the 2013 season this past Saturday, and judging by the way the team looked on the field, there is still a lot of work to be done. There is a philosophy that says a win is a win, but I don't think you can apply this here. True, the Illini did win the game 42-34 over the Salukis of Southern Illinois, but very easily could have lost the game if a couple of plays had gone the other way. The Illini offense, led by new OC Bill Cubit, looked revamped, as redshirt quarterback Nathan Scheelhaase set a career high in passing yards with 416 yards, which is good for tenth all-time at Illinois. The superb outing by Scheelhaase earned him the Big Ten offensive player of the week, and as it turned out, he needed every bit of them for the Illini to come out with a victory. The offense appears to be fine, but the defense, now that is another story. The Illini wasted no time getting on the scoreboard, as they moved down the field and came away with a Taylor Zalewski field goal to take an early 3-0 lead. A lot of preseason hype was placed on true freshman Aaron Bailey and the wonderment of when he would see his first collegiate action. Bailey was able to score his first touchdown in the third quarter, as he rushed up the middle for a 2 yard score. Scheelhaase's favorite target was wideout Ryan Lankford, who caught 6 balls for 115 yards, but was held out of the endzone. Running back Josh Ferguson caught 4 passes for 103 yards, including a 53 yard touchdown strike from Scheelhaase. Junior Donovonn Young had an auspicious start, only gaining 6 yards on 12 carries, but scoring from 2 yards out. No matter how you slice it, the win just didn't feel very good, and it proves the notion that this defense isn't very good and is going to allow a large number of points this season. Special teams looked somewhat better than they did last year, especially the kick return team. Sophomore V'Angelo Bentley returned a kickoff 100 yards for a touchdown, and swung the momentum back to the Illini. It turns out that Bentley's return was the difference in the game, as the Salukis made a late push to make the game interesting. It is also worth noting that the next series after Bentley's return, he was burned by a SIU wideout for a touchdown. Turning a positive into a negative? Could be. This has to have the Illini's next opponent, the Cincinnati Bearcats, licking their chops as they come into Champaign this coming Saturday (11:00 AM CST, ESPN2). The Bearcats welcomed Purdue's new coach Darrell Hazell to the Big Ten with a 42-7 thrashing of the Boilermakers in their season opener at Cincinnati. The Bearcats used a balanced attack, rushing for 221 yards on the ground, while getting 204 yards through the air. Cincinnati quarterback Munchie Legaux completed 13 of 20 passes for 145 yards and a touchdown, but also threw an interception. All told in the game, 12 receivers caught at least one pass for the Bearcats. For the Illini to even stand a chance in this game, the defense needs to improve markedly, and fast. As with all of the high powered offenses in the Big Ten, the Illini need to find a way to defend the pass, or else it will be another long season. Fighting Illini men's basketball coach John Groce got some great news this past weekend, as 5-star power forward Leron Black verbally committed to the Illini. Black, who was highly sought after by Indiana and Tennessee, is from Memphis, Tennessee and brings the total of recruits to 2 for the 2014 season. Champaign Centennial junior Michael Finke is the other player in the class that has given Groce a verbal commitment. Still waiting on the decision from big man Cliff Alexander, who still has the Illini listed among his choices, although Kansas and Michigan State are also in the mix. The Fighting Illini women's volleyball team began the 2013 season on a good note, by going 2-1 in the Long Beach State Mizuno Invitational on the west coast. The Illini began play by upsetting #17 Florida in straight sets, then dropping a match later on Friday night to the host team. The Illini came back on Saturday night and defeated Kentucky to complete a successful weekend. The schedule doesn't get any easier for the Illini, as they are headed to Ames, Iowa this coming weekend to battle #14 San Diego on Saturday afternoon, then coming back on Sunday taking on the #11 host Iowa State Cyclones. The Illini women's soccer team are also underway on the season, and after an opening loss to Notre Dame, the Illini have now reeled off three straight wins, capped by home victories over College of Charleston (6-2) and Illinois State (5-1) to run their season record to 3-1. The Illini will venture west this coming weekend to battle Arizona State on Friday night, then will take on Arizona on Sunday afternoon. The Illini hope to have their star Vanessa DiBernardo in tow, as she was called up to the US women's national team for play on Tuesday. This is a huge honor for DiBernardo, and will be a significant loss for the Illini if she misses any time due to the callup.